This article assumes you’ve just installed Thread from the App Store. Instructions for doing that are HERE. Learn how to create a new team or add users to an existing team below. If you don’t have a Thread team created yet, create one now. If someone else on your team has already created a team and you want to be on it, SKIP THIS SECTION. Open Thread on your iPad for the very first time. Tap New Team in the upper right corner as shown below circled in red. 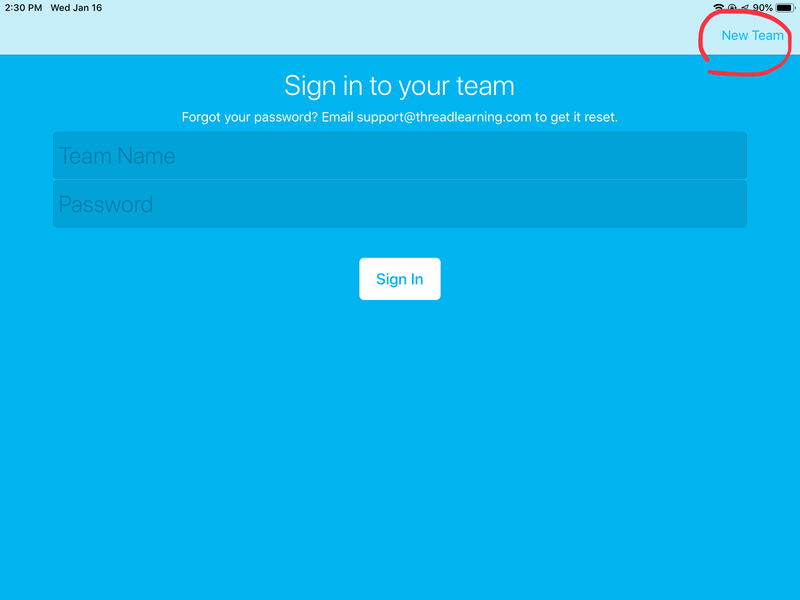 On the next screen, name your team and enter a password. All members of your team will login with these going forward, so choose an easy team name and a password you don’t mind sharing. The password is case sensitive but team name is not. Tap Create New Team. You might notice a message that tutorials are downloading so please give it just a minute. If you just followed instructions above to create a new team, you’ll land on Thread’s Select a profile page. The only selection is + New Teacher, so tap that. This very first instructor will automatically default to supervisor level permissions. If you’re already logged on in Thread, get to the Select a profile page by tapping the Settings gear (upper right corner) and tap Sign Out. This will not sign you out of your team, only your profile. 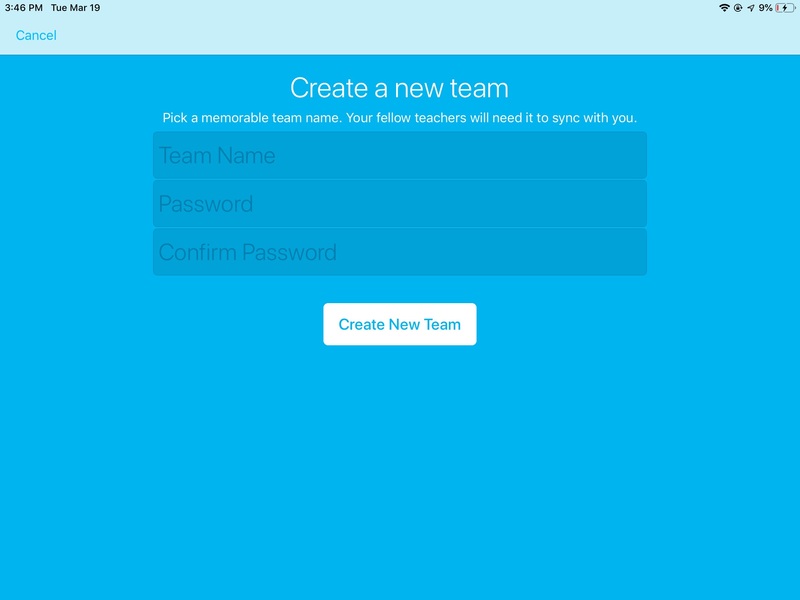 Find and tap + New Teacher, complete Teacher Name and Email Address fields, and tap Done. Only the first instructor defaults to supervisor level permissions. Others default to instructor permissions. Contact the Thread support team to change this. Thread will automatically launch a very quick tutorial using our test student BF Skinner. Keep this student around! The profile is useful for testing new programs or experimenting with dummy data and reports. Notice the speech bubbles. Once those are gone, the tutorial has finished and you can start working live.